Mark you calendars! Carvel is kicking off the ice cream season with their annual free cone day on April 27, 2017, from 3-8pm. Guests who visit participating shoppes will be treated to a FREE junior soft ice cream cone filled with their choice of freshly made vanilla, chocolate or Cookie Butter – Carvel's newest, limited-time flavor, inspired by the irresistibly creamy, spreadable treat from Lotus Biscoff®. 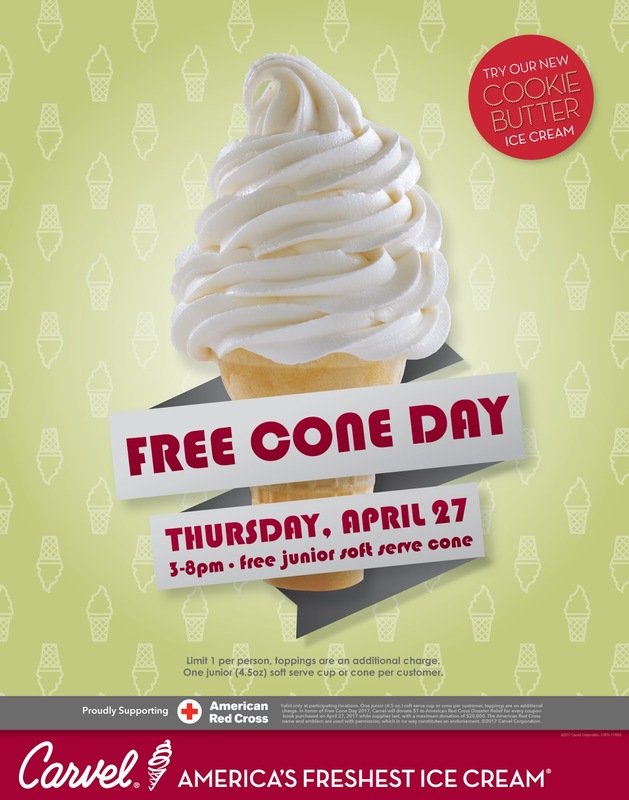 As if getting FREE ice cream doesn't feel good enough, Carvel is partnering for the sixth year with The American Red Cross to spread goodwill in support of the charity's annual Giving Day. Get there early because Carvel will offer a $1 coupon book worth more than $20 in Carvel savings, with all proceeds contributing to Carvel's donation to the American Red Cross, while supplies last. Including donations this year, total contributions to support disaster relief efforts will exceed $150,000. "Free Cone Day is much more than just a 'freebie' day" said Scott Colwell, president of Carvel. "Not only is it the official start of ice cream season, but it's a special day for us to show genuine gratitude to our loyal guests while coming together to raise funds for a very worthy cause." The United States' first retail ice cream franchise, Carvel® Ice Cream has become one of the best-loved and most recognized names in its industry. The company is a leading provider of premium soft ice cream and hand dipped ice cream products, as well as uniquely shaped ice cream cakes, including its signature Fudgie the Whale® and Cookie Puss® cakes. Atlanta-based Carvel currently operates over 400 franchised and food service locations. We buy Carvel ice cream cakes for every birthday celebration. It's definitely a tradition in our home. We can't wait to try the new Cookie Butter ice cream flavor on April 27th! To find a local Carvel Ice Cream Shoppe near you, use the store locator here.